Used Volkswagen Golf SV Review - 2014-present | What Car? What's the used Volkswagen Golf SV hatchback like? It might be true that the popularity of MPVs has declined in recent years with the advent of the SUV, but there are still those who need all the attributes of a normal hatchback but with a little added practicality. That is in essence what the Volkswagen Golf SV offers. It takes the platform of the Golf Hatch and stretches it by 50mm and then raises the roof height. Together these give the SV extra rear seat passenger space inside and more head room to make entering and exiting the car easier, or the task of getting a baby or toddler into a child seat a less stressful affair. It also makes for a bigger boot than the hatchback, with its 1520 litres of space with the rear seats down almost equalling the Golf Estate’s. The rest of it should appeal to those who would like or want a regular Golf. To keep it up to date, it was substantially facelifted in 2017, at the same time as the normal Golf, with more efficient engines added and some tweaking to the standard equipment. To that end there’s a range of excellent engines borrowed from its sibling, starting with a 108bhp 1.0-litre three-cylinder petrol unit, edging up through a 1.5-litre petrol in two states of tune and finishing with 1.6 and 2.0 TDI diesel engines. Earlier models offered the option of a 1.2-litre petrol engine and a 1.4 in 125bhp and 150bhp outputs, subsequently replaced during the facelift by the 1.0 and the 1.5, as well as a 1.6-litre diesel in a lower-powered variant. Trim levels start with S, which isn’t lavishly equipped but does include air-con, Bluetooth, an 8.0 touchscreen and a DAB radio, head through SE, which adds alloy wheels, auto lights and wipers and parking sensors, on to SE Nav, which as you might expect adds sat-nav, and end up at GT, a sporty trim that adds firmer suspension and larger wheels. On the road the good news is the SV isn’t far off the all-round competence of the standard Golf. There’s more body lean through the corners, even if the balance of body control and ride quality is well struck. Mid-corner bumps are handled with an impressive deftness and there’s plenty of grip, so you can hustle the car along a twisty B-road surprisingly swiftly. On the motorway it impresses, too, with a surprising lack of wind noise for such a tall body. You also get the benefit of a raised driving position, making the car easy to place on the road, thanks to impressive all-round visibility. Road noise, at least on the larger 17in wheels, is a little intrusive, though. Of the power options, the 1.0-litre engine is a little disappointing and not really up to the work of hauling the SV around. The more powerful 148bhp version of the 1.5 unit impresses with its low-down grunt and willingness to rev, and it feels particularly peppy when paired to the slick optional seven-speed DSG automatic gearbox (a six-speed manual was a standard fitment). However, it's significantly more expensive than the 128bhp version, even used, and fractionally less economical. The diesels offer plenty of low-down grunt, especially the more powerful 2.0 TDI 150, mixed in with good real-world economy and reasonable refinement. Inside, there’s familiarity in the specially designed interior, too. 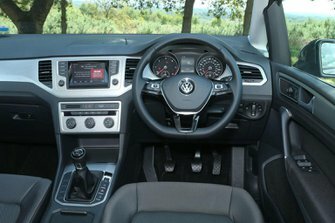 Neat switchgear, high-quality finishes and sound ergonomics reprise the standard Golf, but the controls are better positioned, being less angled towards the hot seat. The driver sits higher than in the hatchback, too, giving a good view through the glass expanses while avoiding the feeling of being perched too high. Space-wise, head and leg room is excellent front and back, even with the slidable rear bench – to increase either boot space or passenger space – in its mid-way setting. The boot has a flexible floor that can be set to various heights (including flush to the boot lip) and has flaps that smooth over the not-quite-flat floor when the seats are folded forward. The rear seatbacks split 40/20/40, and children will enjoy the tray tables on the backs of the front seats. 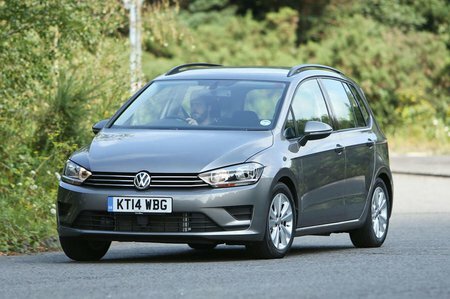 In terms of outright size, the highly polished Golf SV offers fractionally more boot space than its closest rival, the BMW 2 Series Active Tourer. However, it’s hard to ignore that VW's own, cheaper Golf Estate offers even more outright boot capacity and is also a fraction nicer to drive.